One of the biggest complaints among people who are involved in tourism in Tzfat is the fact that few tourists spend the time needed to really explore and understand the city. Tzfat is one of Judaism's four Holy Cities, rich in history and heritage, and central to understanding how Judaism developed to what it is today. People throughout the world are fascinated by Kabbalah, Jewish mysticism, but even those who make their way to the City of Kabbalah don't get the chance to properly understand what Kabbalah really is. If this is the situation today, 30 years ago, it was much worse. Tzfat's thriving Artist Quarter received its fair share of visitors, but guides who understood the place of Tzfat in Jewish history and could and would explain it to the visitors whom they were guiding were few and far between. 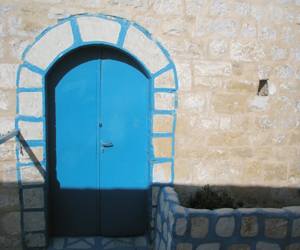 Yisrael and Phyllis Shalem arrived in Tzfat in 1980. Both were American immigrants who had completed their Israeli army service and subsequent university studies in Jerusalem, and were drawn to Tzfat. Yisrael worked for a time with Jewish Agency summer programs. His high school teaching job frustrated him -- he saw that he was spending too much time on discipline and too little time instilling love of Torah and the Land of Israel in his students. He preferred the informal education of his summer program youth group work. Yisrael began to guide groups in Tzfat, and as time progressed, became more and more convinced that, with the proper infrastructure, many more visitors would be able to appreciate Tzfat and its rich history and traditions. He and Phyllis wrote a basic tour book of Tzfat, Six Self-Guided Walking Tours of Tzfat, which has, through time, become the most used Tzfat guide for both tour guides and tourists who want to have a more complete and fulfilling Tzfat experience than the simple "in-and-out of two synagogues and shopping" which unfortunately characterizes many visits. Yisrael also produced a short 10-minute movie, Tzfat, the Mystical City, which can be viewed today at the Tourist Information Center of Tzfat. Whereas the book concentrates on Tzfat's sites, the movie gives an overview of Tzfat's history from the Spanish Expulsion period onward. Many visitors who otherwise would not understand why Tzfat occupies such an important place in the history of Judaism gain a thorough understanding through the movie. Yisrael and his partner, Haim Sidor (who, in addition to his guiding, is well-known today in Tzfat for his work in mapping out Tzfat's cemetery) ran afoul of the Ministry of Tourism for their lack of a guiding license, which is required by law in Israel. The two guides insisted that the Ministry representatives come on one of their tours, and by the end, the Ministry officials continued to insist that Yisrael and Haim become licensed.....but asked that THEY organize the course (and teach in it!) which would grant them, and other guides of the area, their licenses. Yisrael and Phyllis collaborated together, and later with the travel writer Aviva Bar Am, on other Land of Israel guide books, notably on the Golan Heights, Tiberias Region and the Negev. As a book about Jerusalem was being written, Yisrael passed away after battling cancer for 3 years. Yisrael and Phyllis's guide is still the premier Tzfat guide for visitors who want to get a further understanding of the town and its history. It can be purchased by writing to the Shalem's son, Medad. Medad can be contacted at [email protected] Medad has completed courses in Land of Israel studies and his love of the Land is a testimony to his remarkable father.